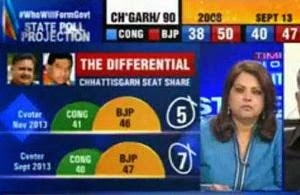 Opinion polls are at the center of disputes relating to these debates on news channels Congress has decided to stay away from . The party has directed all its spokesmen and TV Panliston that they avoid taking part in programs based on opinion polls . The BJP termed the decision of Congress is ridiculous . BJP says that the wind blows in favor of the BJP, Congress , frightened by the ban on opinion poll is demanded.